I’m starting my blog with an introduction to the tool that makes it possible for me to weave the rugs you see on my web site. 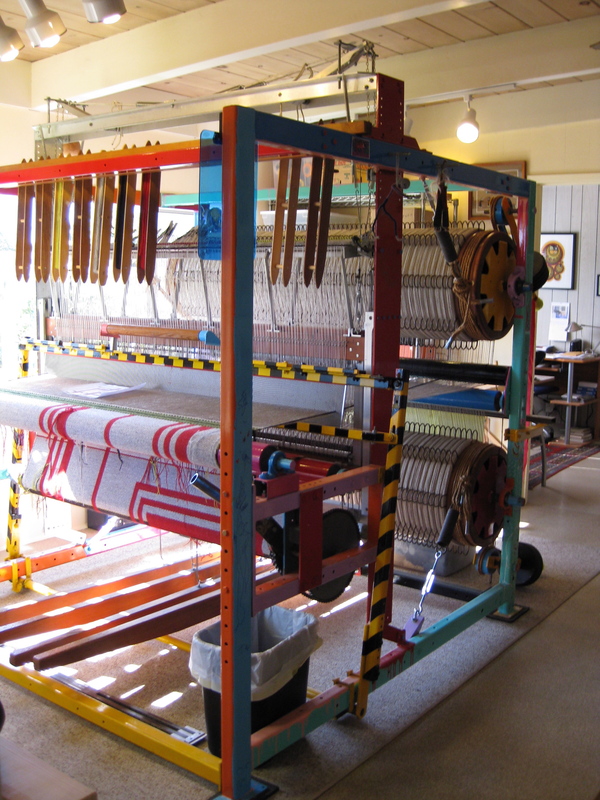 It is a custom made loom made by a man who made specialized looms for a handful of people. As far as I know, the maker of the loom only made one other just like mine. I have been unable to locate the person he made it for. It would be fun to compare notes. The loom can be cantankerous at times, but I overlook that factor because it makes the kind of sturdy, tightly woven rugs I like to make. When I first acquired this loom from its original owner, it was in pieces in her garage and had not been used in three years. There was a lot she could not remember about how it went together, and there was no instruction manual. There was rust on some of the steel parts and some corrosion. After much wire brushing and scraping, with the help of a friend, we managed to get it set up. The builder lent me his photo album of all the looms he had made, including mine. That was in 1999. Oh, and the loom acquired the name “Wee Geordie.” The name will be explained in my next blog post. Stay tuned! 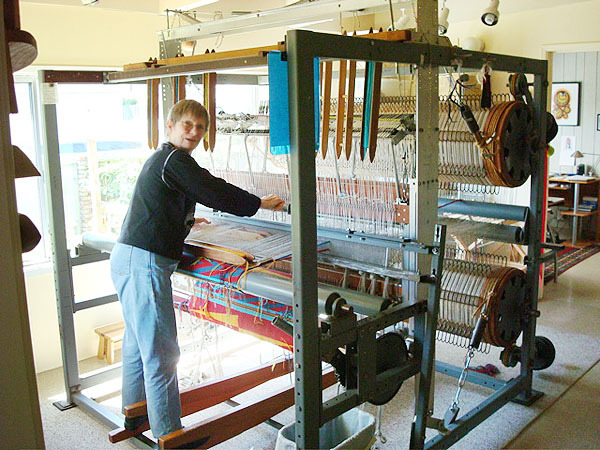 When I got the loom it was gray in color and looked like this. You can get an idea of the size of this machine in relation to my size. It is big! It was so big that I didn’t want to have it in the house I was living in at the time, so I rented studio space for about four years. After being moved to Minnesota for four years and then back to Eureka, it is now in my home studio. A few years ago my partner/significant other/best friend/sweetheart Jeff, an artist, suggested that he paint the loom in a variety of bright colors and that we invite other artist friends to add their tag to it. Here is the loom in its new glory. Photos below are of two of the images friends have painted on the framework. There are many more of these tags. These little pieces of art and the bright colors of the loom make it fun to work on. When guests come to our house we urge, sometimes coerce, them to contribute to this ongoing art project. One Response to "My Rug Loom"
Lovely work. I wish to follow the blog!